Like most of my house my sewing room is half decorated. I’ve told you before how I adore Tulip’s soft paint for clothing so when I saw that they’ve come out with a new Tulip For Your Home line of paints and stencils I decided to knock out a few of the projects I’ve been meaning to get to including a new cover for my ironing board. I have this small sized ironing board that I threw on top of a oversized storage crate that lives on the side of my couch. Most of the time I use it as a side table with built in storage but every once in a while I do still use it for ironing (I use my pinning/ironing board most of the time). The only thing is that the cover totally clashes with my studio decor. Thankfully now it fits and just looking at it makes me happy. 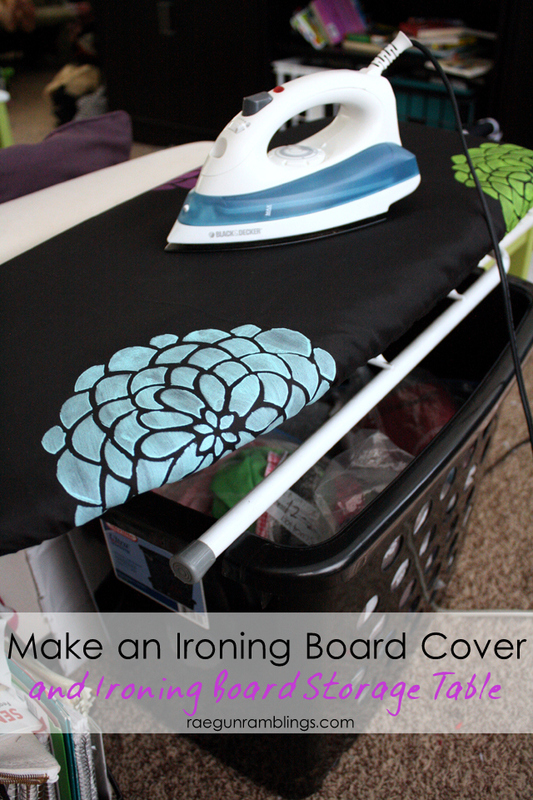 To make your ironing cover just lay the old cover down on top of your fabric. Trace around two inches from the edge and cut. I just needed a tutorial to cover and match my decor but if you need one with insulation and padding you can easily just cut a layer of heat resistant padding and a second piece of fabric. Layer the insulation in between the two fabric pieces and then just continue with this tutorial treating the three layers like my one piece. 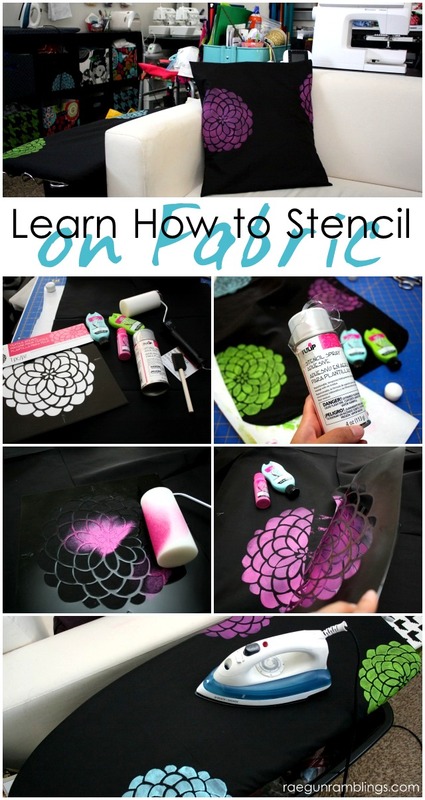 If you want to stencil your fabric do that before you go to the next step. See how to do that below. Finish the edges of the fabric by serging or stitching with an overlock stitch. But really if you skip this step you’re probably fine since the cover will pretty much just sit in the same place. Fold under about 1/2 inch and sew a casing about 1/4 inch. Start at the bottom straight end and leave a small hole about 1 inch wide. Using the safety pin feed the thread through the casing. Fit over the ironing board, pull tight and tie in a bow to secure. If you want to stencil your fabric first decide where you want the stencil to be. 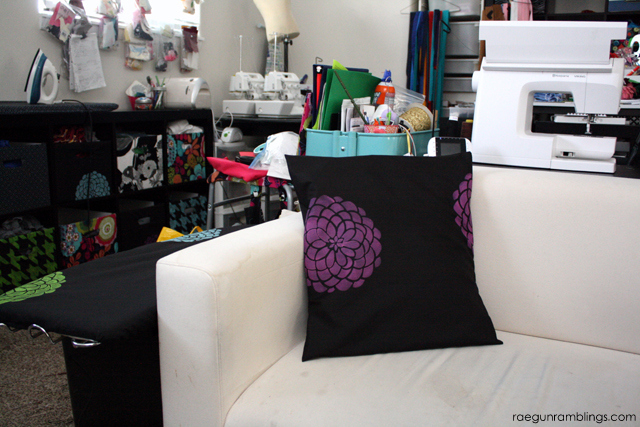 Then spray the back of your stencil with stencil stray and stick it on your fabric. The stuff is like magic, seriously it makes stenciling so so easy and it doesn’t leave residue on the fabric. I only had to spray it once and I was able to re-position it on all the different fabric pieces i used it on. The flower one I used 6 times! Put a small amount of paint on a paper plate or scrap of card board. 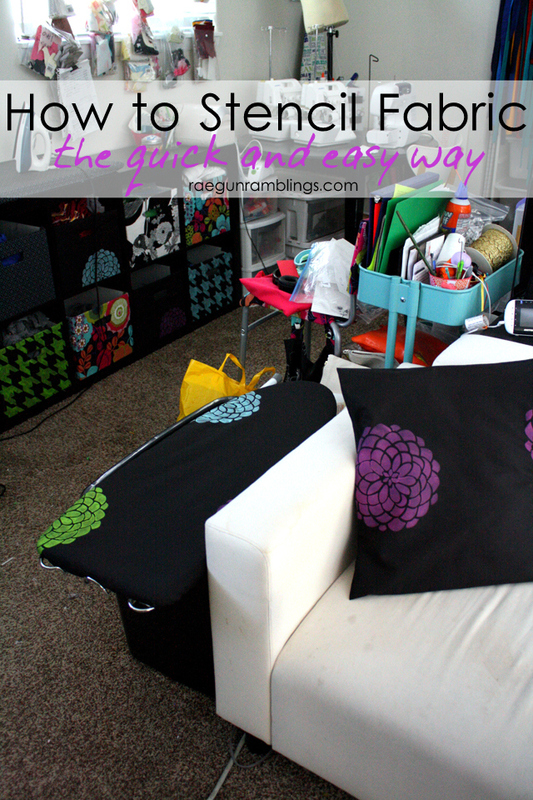 Use the foam roller or foam brush to paint on the fabric. I still can’t decide which tool I like better but the stencil spray is so good that if you use the brush you can actually brush it and not just press it down. Peel the stencil off while still wet. Allow to dry. I love love love how my ironing board turned out. I might have got a little stencil happy and decided to hit up a few other spots. It makes me so happy to look around and see all my coordinating stuff. 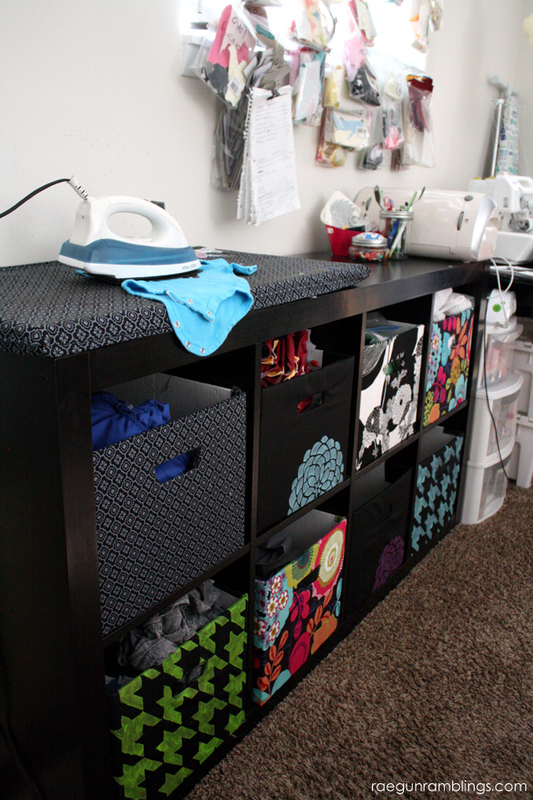 I used my fabric covered box tutorial to pretty up more of the storage spaces I use for my Ikea shelves. Because every inch of my studio needs to be functional stenciling and some basic fabrics really helped to pull everything together. 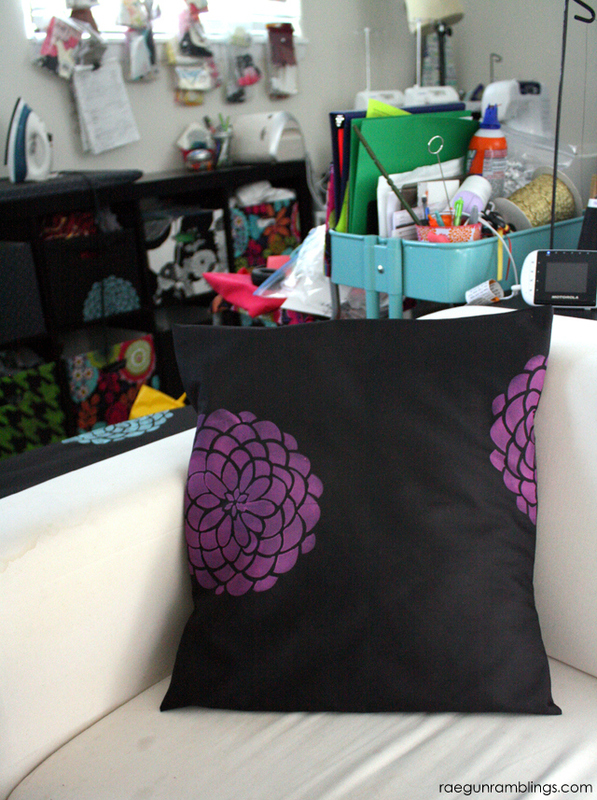 Finally I whipped up one of my DIY 10 minute pillowcases and hit that with the stencil too. I told you crazy. But good crazy right? Thanks so much for Tulip for sponsoring this post. It’s awesome to work with a brand that I have loved and used for years and years. I found my Tulip home decor stuff at my local Jo-Ann Fabric and Crafts store over in the home decor section. 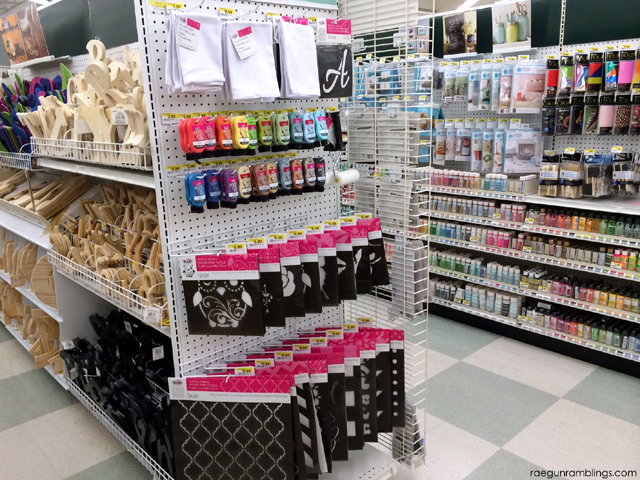 They have a bunch of colors but if you don’t find something that matches your project keep in mind that you can mix fabric paint to get the right color and that they have a ton of colors of the soft Tulip paint in the craft department too. Visit Tulip on facebook, twitter, and pinterest and check out more awesome stenciling projects from my blogger friends! LOVE this!! So cool. I want that pillow in my house! NOW! Can’t wait to try this. 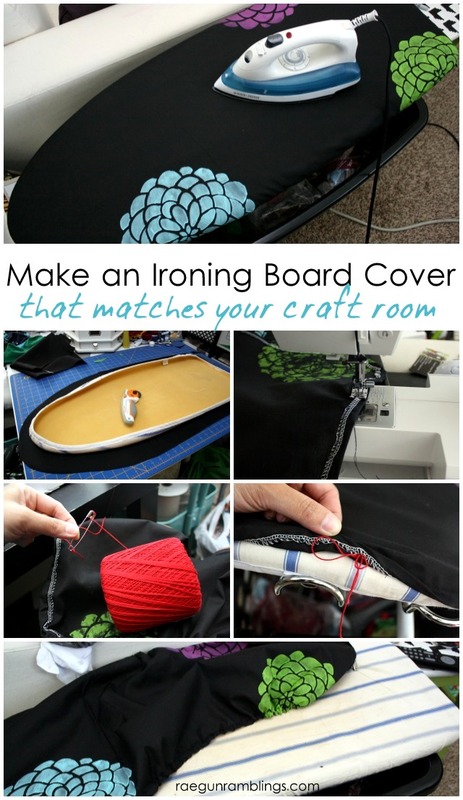 I love how graphic the stencils are on the black background, and I LOVE the idea of making a custom ironing board cover – so clever. The storage boxes look really fun and fantastic, too. Thanks Heather. I’ve been meaning to do the ironing board for ages. It was SO easy I wish I had done it forever ago.